The annual Diocesan Family & Youth Conference will be held from Wednesday, July 17th, 2019 to Saturday, July 20th, 2019 at Kalahari Resorts & Conventions in Pocono Manor, Pennsylvania. The theme of this year’s conference will be “Jesus Christ the Foundation.” We are blessed to have two main speakers to present on this theme: Reverend Father Abraham Thomas, Professor of Patristic Theology at the Orthodox Theological Seminary in Kottayam, and Very Reverend Dr. John E. Parker III, Dean of St Tikhon's Orthodox Theological Seminary. Our clergy and faithful are requested to complete their registration by February 15, 2019 to ensure they receive the discounted rates. As we do every year, a Souvenir will be published which will highlight the various ministries and events of our Diocese. Our faithful are humbly requested to offer their support in publishing of this souvenir. The corporate effort of our clergy and faithful will ensure that this year’s conference will be a great blessing for our Diocese, as it has been in the past. For further information, please contact Reverend Father Sunny Joseph, Coordinator, Mr. Joby John, Secretary, or Mr. Mathew Varughese, Treasurer. 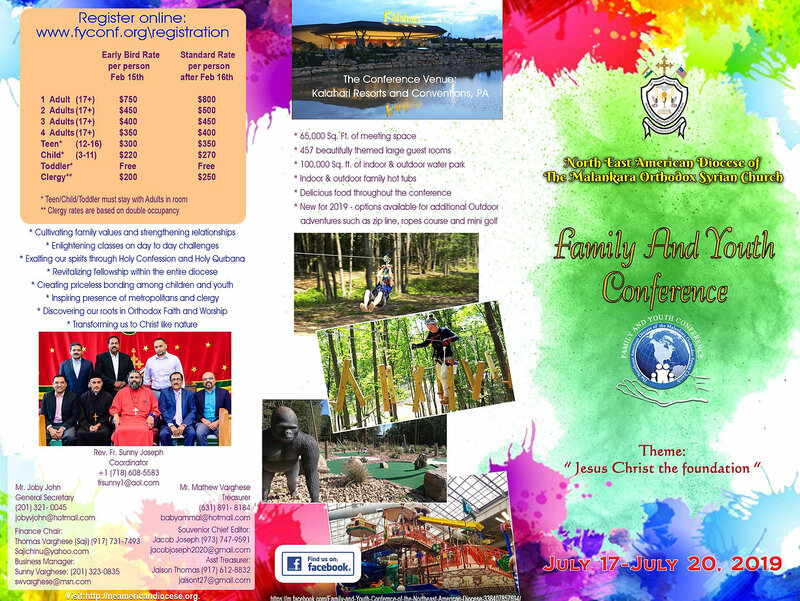 Further details can be found in our Diocesan Metropolitan's Kalpana or the Brochure for the Diocesan Family & Youth Conference.